When Sailor Moon Crystal debuts in Japan next month, it will bring the preeminent magical girl (also known as mahou-shojo in Japanese) anime back to TV for the first time since 1997. But Sailor Moon isn't the only anime superheroine deserving of a comeback — here are seven more magical girls we'd like to see back on the air. Although Sailor Moon brought the magical girl genre to the forefront, the four-woman art team known as Clamp is probably the best-known mahou-shojo comic maker. One of their works is Magic Knight Rayearth, which takes three 8th-grade girls, transports them from a school field trip to Tokyo Tower to a fantasy world where they have big swords and magic powers, and sets them on a very videogame-like quest to rescue a princess from an evil priest. 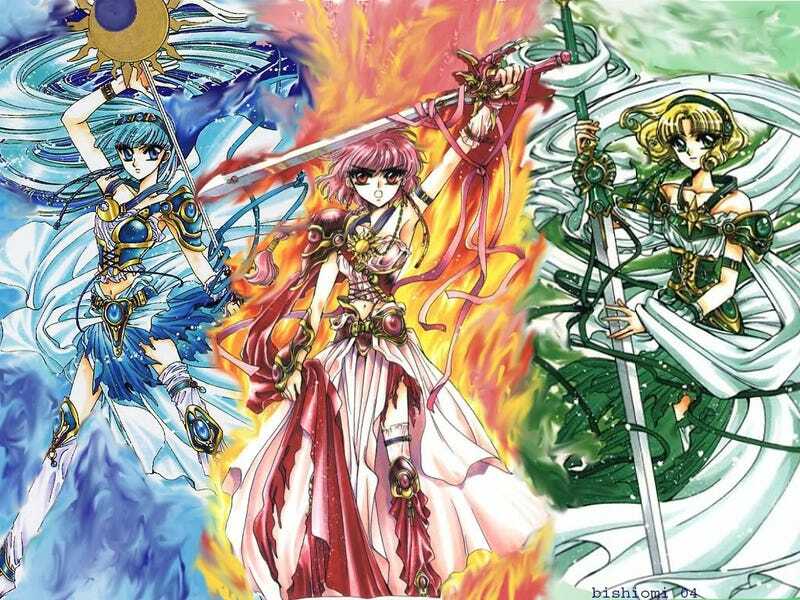 A blueprint for a classic, 16-bit Japanese RPG game as much as a manga or anime, updating Rayearth to take place in modern MMORPGs would be a breeze, especially with the ever-growing ranks of female gamers. Frankly, we could always use more series about damsels in distress getting rescued by badass women. Like pretty much everything about Japanese manga, the foundation for the magical girl genre was laid down by by Oszum Tezuka, the "god of manga." Besides setting the visual style that would dominate the art form, and creating myriad beloved characters like Astro Boy, Tezuka worte Princess Knight from 1953-56, about a princess named Ribbon who had to pretend she was a boy to inherit her father's throne (to prevent an evil Duke from taking over the kingdom). While living in a medieval fantasy world, and thus lacking the trademark sailor suit, Ribbon still had time to dress up in a Zorro-style mask to fight evil as the mysterious Phantom Knight. While it could use some updating (for instance, she has an angel palling around with her, and the reason Ribbon is so adventurous is because she has a boy's heart as well as a girl's heart), it would be very cool to bring this classic Tezuka character to modern audiences. If the Sailor Scouts of Sailor Moon were the Beatles, then Card Captor Sakura was a one-girl Rolling Stones. The almost-as-popular series from Clamp ran concurrently with Sailor Moon, presenting the same basic themes — a girl with hidden, magical powers who fights evil in a schoolgirl uniform — with some essential differences; Sakura was much younger that the Sailor Moon girls, she was tasked with collecting magical Clow Cards for a little "Gotta Catch 'Em All" structure, and of course her posse was otherwise magical girl free. Still, Card Captor Sakura didn't suffer from a lack of popularity, spawning movies, videogames and more. But the real reason CCS deserves a modern remake is that the show was butchered — butchered — when it came to America. The show was edited to turn Sakura's love interest Syaoran into the main character even though he had half the screen-time of the real main character — and Sakura was even dropped from the U.S. title, which ended up as Cardcaptors. Cardcaptors was so terrible that anime licensor Pioneer couldn't sell the DVDs of the adaptation, despite it being on TV… while the DVDs of the original Japanese version sold just fine. Utena was a magical girl series ahead of its time. A mix of artistry, complex storytelling and forward-thinking gender politics wrapped in what only seemed on the surface to be a run-of-the-mill magical girl series, Utena has been a cult favorite ever since its 1997 debut. Clearly inspired by Princess Knight, Utena subverts a great deal about the magical genre genre. Utena is a young girl who is determined to become a prince, and while at the Ohtori Academy, she has devoted herself to protecting Anthy, a disturbingly meek damsel-in-distress with a secret dark streak. The girls lust after Utena, the boys constantly duel Utena for Anthy, her relationship with Anthy is far from healthy — but who wins the final duel will win Anthy, and supposedly the power to revolutionize the world. Frankly, other than adding modern animation, there's virtually nothing that needs to be added to Revolutionary girl Utena — although perhaps a bit more context for the scene where Utena turns into a car would be nice. While Princess Knight laid the foundation, Sally the Witch was the series that built the magical girl genre. Inspired by the American sitcom Bewitched — which was phenomenally popular in Japan — Sally is about the titular witch who longs to leave her Magic Kingdom to hang out on Earth. When she sees two schoolgirls in trouble, she can't help but come down, and with two new friends, decides to stick around a while. Much like Samatha on Bewitched, Sally tries to hide her supernatural powers from all the regular humans she encounters, which leads to many a wacky mishap. Sally the Witch had a remake in 1989, but it's high time we brought her back for round 2. Akazukin Chacha — best translated as "Red Riding Hood Chacha" — never made it over to the U.S., so don't be concerned if you haven't heard of it. It takes the classic fairy tale pretty liberally, in the sense that Red is a young, accident-prone, apprentice witch named Chacha who hangs out with a young, OCD wizard named Shiine, and an aloof pup of a nearby werewolf clan named Riiya (whose werewolf form, by the way, is adorable). The anime deviates from the manga by making Chacha a full-on magical girl, with a pendant that lets her transform into the powerful (and grown-up) Magical Princess, but only when she's with Riiya and Shiine. While Akazukin Chacha hits all the main tropes, it's also, really really funny — one of those cartoons for young kids that can be enjoyed by people of any age.